A dome-shaped house in Palm Springs has undergone renovation work by its owner, Los Angeles-based architect Pavlina Williams, who added new windows and created open-plan interiors. Williams renovated her home from the inside-out, acting as the general contractor while gutting the interiors, and ripping down walls to create a light-filled space inside. She designed new custom-made windows to surround the dome in a geometric arrangement and form a focal point of the building. Built in 1956, the Palm Springs Dome House comprises a half-globe portion and a rectangular section. Brown asphalt roof shingles cover the rounded exterior, with other portions made up of glass and light brickwork. The location of the mid-century house allows for 360-degree views of the surroundings, including Joshua Tree and Coachella Valley, as well as a collection of wind turbines. Originally, the home had a gridded layout of small rooms that were lined in carpet and vinyl linoleum. The residence had barely any windows, blocking the panoramic desert vista. Williams updated the flooring to polished concrete and incorporated white surfaces and metal in her redesign. 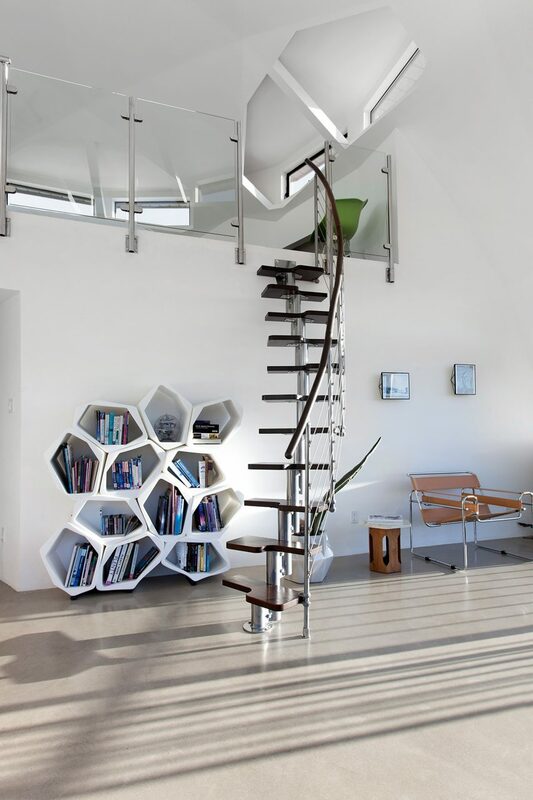 A new spiral stainless-steel staircase by Fontanot leads up to a lofted section in the glazed atrium. The new windows are best appreciated from a sitting room on the ground floor, where domed construction is expressed across the ceiling, which reaches 26 feet (eight metres) at its highest point. White cabinetry, an exposed brick wall that acts as a backsplash and an overhead timber beam all feature in the kitchen. Palm Springs Dome House also contains three bedrooms and three baths, with a sleeping area and bath in its lofted portion. Williams also selected all of the furnishings t0 include an assortment of mid-century chairs alongside other contemporary pieces. 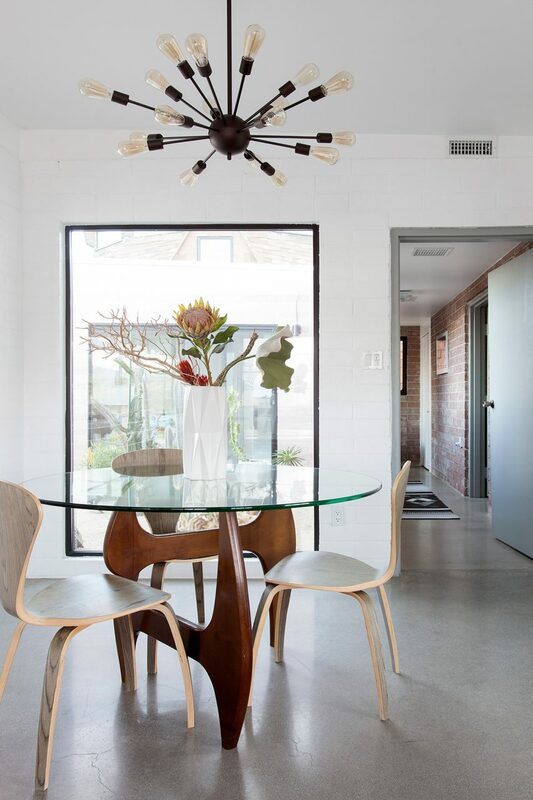 A series of wooden Vortex dining chairs with V-shaped backs are interspersed throughout – around a large round dining table, beside another glass table, and next to a hightop kitchen island. Near the staircase is a caramel leather Wassily Chair, also known as the Model B3 chair, designed by Hungarian designer Marcel Breuer in 1926. The chair is situated alongside a small table, potted cacti, and a pod-like bookshelf. A pair of colourful Acapulco Papasan chairs in the sitting room are positioned on either side of a new built-in fireplace. Upstairs, a pair of lightwood seats takes cues from the mid-century slatted chairs by Arthur Umanoff. A small ground-floor office with an exposed brick wall also features modernist furniture, like an Eames Molded Plastic Armchair Rocker in white, which is repeated in bright green upstairs. Sliding glass doors open to a patio with an outdoor dining area. The garden is landscaped with tall cacti, boulders and stepping stones. Attached to the side of the house is a smaller white geodesic dome that currently houses a fibreglass jacuzzi. “We are planning to rebuild the white dome in the same shape and make it an additional bedroom, with a round bed in the middle and several skylights right overhead,” said Williams. During the 1970s, dome houses became popular in the American Southwest, as part of a back-to-the-land movement that swept across the country during the era. Williams’ residence is among Palm Springs’ substantial collection of modernist buildings, which includes the Kaufmann House by Richard Neutra and the concrete-domed Elrod House by John Lautner. Photography is by Krista Jahnke.